Today marks 6 months since we moved to England, and I think it's safe to say we are still delighted with the shift. Being here feels utterly and completely right. I feel like I am living the life I'm meant to lead. 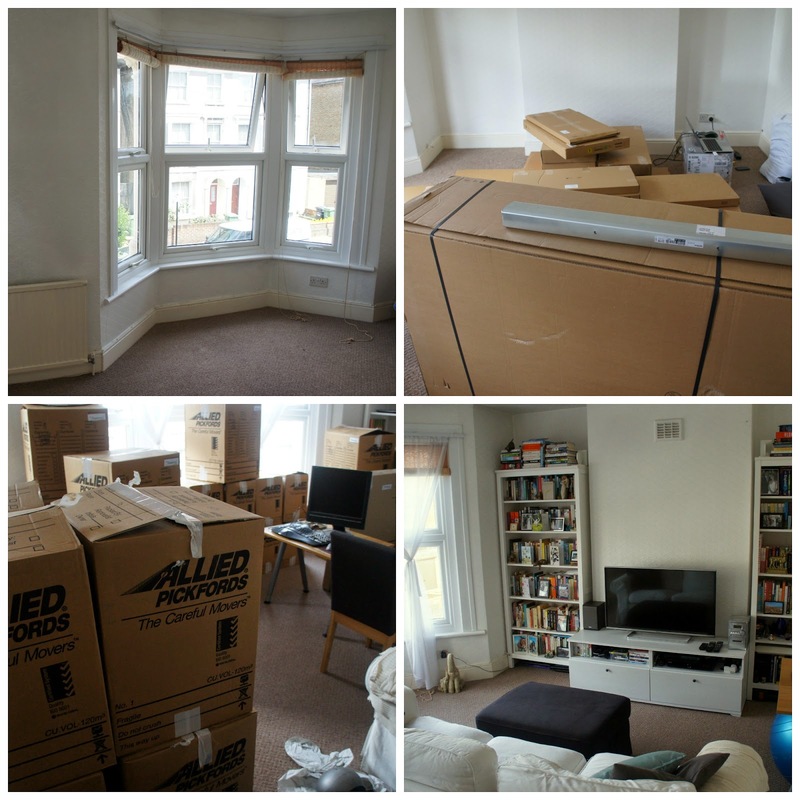 Given the date, I thought it might be nice to share some before, during and after photos of our London flat. I showed pictures of it empty when we moved in, and shared a few photos of boxes along the way, but it took until October for our Australian shipment to arrive and until this week (!) for us to get a few boxes taken away again and into storage. It's certainly been a long process to get all our belongings in place, and along the way we have had stark minimalism (i.e,. 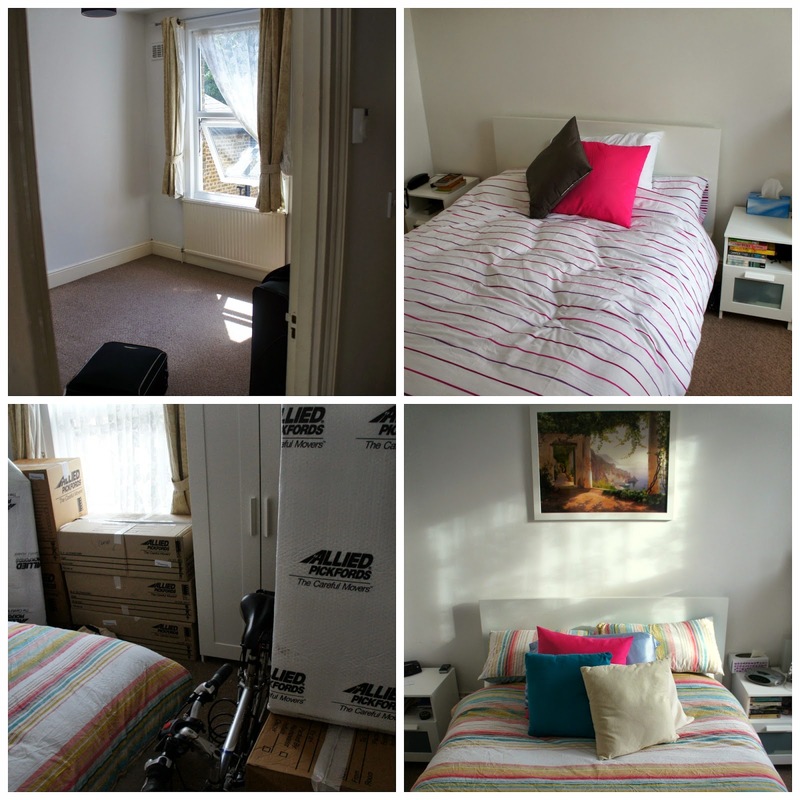 hardly any furniture or possessions) and serious clutter (boxes everywhere). Neither extreme was ideal. The most noticeable changes are in our front room, which is living and dining area combined. It is our largest room, and so it has been the most obviously empty and the most obviously full. For a long time it also featured empty bookshelves. As shown in the bottom right picture above, they are now very full bookshelves. I do think books are an essential feature of a home. Our white sofa is a bit risky given Mr Bite and I are both capable of spilling and staining the white fabric. It is an Ikea Ektorp model, and we bought it with the intention of getting a blue-green cover through one of the many companies that makes Ektorp covers. Ikea charges hardly anything for their white cover and it doesn't cost much more to choose from the colours available outside of Ikea, rather than getting one of their standard coloured options. In the end, though, we liked the way the white looked and I have washed the covers a couple of times with modest success. We'll wear this one out and then consider buying a replacement! One of my favourite pieces of furniture is a corner cabinet that fits behind our living room door, out of sight most of the time. Without it, I would have been hard pushed to fit in my large serving platters and vases. I've never had a corner unit before but it is a great idea if you're short on space. Also helpful from a space perspective is our dining table, which as pictured has one extendable edge out. It can be a bit smaller, or a bit larger, depending on what we need. Moving on from the living room, our bedroom has also been through several stages. After our shipment arrived, we could barely fit in the door. I'm pleased to say floor space is again available, I found a bedspread I liked, and our Australian bedroom picture is back in its appropriate place on our new wall. The storage boxes under our bed are also really helpful in allowing everything to fit. I have shared other aspects of the flat before - my storage trolley and boxes in the kitchen, and our green cupboard in the hallway. The flat being what it is, that is the extent of our rooms (bathroom excepted)! 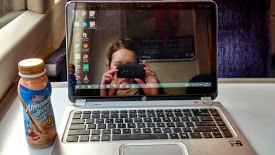 I am quite impressed we have managed to fit, and it has taught me the value of scaling back belongings and seeking out furniture that gives maximum utility. Now we are moving steadily towards Christmas, the next focus will be adding Christmas decorations...on a small scale, I think. What is your favourite furniture piece, and have you found your belongings have needed to change in past moves? Every time we move we seem to buy houses with totally different dimensions, meaning not everything fits and so some things need replacing. Moving and fitting yourself to your new home can be quite challenging, can't it. It can! I hope our future houses accommodate our new furniture...I don't want to think about buying yet more! looks great - our bedrooms have evolved since Sylvia was born - especially her room but it is now pretty squishy - we have a purple sofa that is getting quite ratty but I want to keep it a few more years because sylvia is pretty bad with spilling stuff - not sure we would cope with a white sofa. Love the corner cupboard - it is lovely to be able to display some of the nice kitchen dishes as well as it being practical. I do think white is fairly impractical for most, and especially so for children. Purple sounds safer (and brighter)! Thanks so much Charlie. It does make me feel for those who have a less positive experience...it must be very tough in such situations. You've got such a nice flat! So bright and with so much great light. It's wonderful to hear how well you've settled in. I'm so happy that life in London has been everything you thought it would be, and maybe more besides! I've really enjoyed seeing the city through your eyes. It's certainly given me a fresh perspective and highlighted some areas that I definitely need to explore!